This chapter offers a foundation for topics found later in this book and in subsequent books on Zen. For a more complete hands-on experience, also try the Zen QuickStart Tutorial, which is available from the Documentation home page. Choose File > Change Namespace or F4. Choose File > New or Ctrl-N or the icon. Click the Zen Page icon. For Package Name choose ZENDemo. For Application Name choose ZENDemo.Application. Move the cursor up to the blank line and click to move the insertion point there. Type a left angle bracket (<) to display a context-sensitive list of XML elements. Type a space to display a context-sensitive list of XML attributes. Choose Build > Compile or Ctrl-F7 or the icon. Choose View > Web Page or the icon. Your simple new Zen page displays Hello world! on the face of a button. If you encounter difficulties during this exercise, review The Zen Demo and Supported Browsers in the chapter Introducing Zen. These sections provide useful background information for getting started with Zen. Click the Zen Application icon. The Zen Application Wizard presents the fields shown in the following table. For this exercise, enter the values shown in the right-hand column of the table. Description Any text that you want to use to describe the application. This is my first new Zen application. /// This is my first new Zen application. /// This is the name of this application. /// This is the URL of the main starting page of this application. /// This Style block contains application-wide CSS style definitions. A Zen page class extends %ZEN.Component.page to define the contents and behavior of a web page. In this exercise you create a new Zen page class in several steps. The Zen Page Wizard presents the fields shown in the following table. For this exercise, enter the values shown in the right-hand column of the table. Domain The domain this page uses for localization of caption text. For this exercise, leave the Domain field empty. Description Any text that you want to use to describe the page. My very first Zen page class. Page type Regular page, or subclass of a template page class. For this exercise, leave the Page type field with its default selection of Page. For this exercise, click Title Page. Then click Finish. /// Class name of application this page belongs to. /// Displayed name of this page. /// Domain used for localization. /// This Style block contains page-specific CSS style definitions. /// This XML block defines the contents of this page. XData Style defines a style rule called #title that defines a background color, padding, borders, and font characteristics for HTML output. XData Contents uses the <page> element to define a page object. XData Contents uses the <html> element to define a simple HTML excerpt for display in the browser. The id value title creates the connection between the html object and the #title rule from XData Style. The html object formats a string of text, Title. The resulting output functions as a simple title bar for the page. XData Contents provides an empty <vgroup>. Later exercises add components here. In Studio, open the page class. Place the cursor between <vgroup> and </vgroup> and click to move the insertion point there. Choose Tools > Templates > Templates or press Ctrl-T to display the Studio Templates dialog. Click OK to display the Zen Element Wizard dialog. Define a button object as a child of the vgroup object. This places the button at the top left-hand corner of the display, under the title. The button is an instance of the %ZEN.Component.button class. The id value myButton provides a way to find and manipulate the button object programmatically. The caption value Press Me indicates the text that is displayed on the button when the page appears. At present, if you click this button it does nothing. Place the cursor just below the closing curly brace of the XData Contents block, but above the closing curly brace of the page class. Click to move the insertion point there. Clear the Try/Catch check box. Click OK to close the popup. When this class is compiled, the btnClick method is not be available as a callable method on the server. It is available as an instance method of the zenPage object on the client. At runtime, this method runs in the client (browser) environment. The method is defined in the same logical unit (that is, the class) as the page definition that references it. This makes pages easy to develop and maintain. HTML needed to display any components that generate HTML (such as the button component). Using techniques from the previous exercises in this chapter, add a new button inside the XData Contents block. Give the new button the attribute values listed in the following table. Position the cursor just below the closing curly brace of the XData Contents block, but above the closing curly brace of the page class. Click to move the insertion point there. Now the ObjectScript method BtnClickMe executes the ObjectScript $ZVERSION or $ZV utility, which produces a text string that describes the Caché version that you are running. Use the View Source option of your browser to look at the HTML. It is defined as an instance method. It omits the Language keyword. This means that this method uses the default server scripting language, which is ObjectScript. The possible scripting languages are ObjectScript, Caché Basic, or Caché MVBasic. It executes on the server but (as further notes explain) it also sends a hyperevent to the client. It uses the ZenMethod keyword. The ZenMethod keyword means that this is a server-side method that can be called from the client. Even when this method is called from within the client (browser) environment, it is still executed on the server. This behavior is provided by the CSP hyperevent mechanism. For details, see the section Server-Side Methods in the Tag-based Development with CSP chapter of Using Caché Server Pages (CSP). 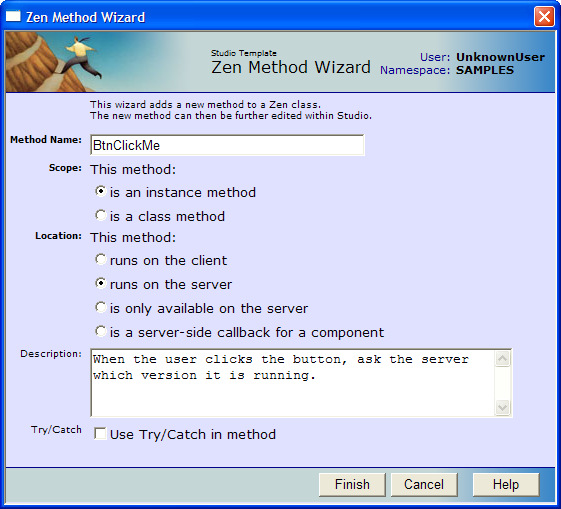 The client-side zenPage object can invoke your server-side BtnClickMe method. Because you defined BtnClickMe as an instance method, the server needs the current client-side object’s complete state to be able to execute the method. When zenPage invokes your server-side method, the client-side implementation of BtnClickMe gathers up any argument and object context information available on the client side, serializes the entire page object and sends it through to the server, then invokes the server-side method, all using the CSP session-encrypted hyperevent mechanism. BtnClickMe does not return a value. This is intentional. When you use CSP hyperevents, a method with no return value automatically runs asynchronously (does not wait for a response). This way, the user interface does not appear to freeze as it would if it had to wait for a method to return a value. The &js< ... > should ONLY be used when working in Synchronous mode and interacting with ClassMethods where no DOM synchronization is happening. In an instance method, if you are modifying elements in the DOM, this code is returned by the hyperevent, bundled into a function and executed in the browser immediately on return; then the DOM is updated, overwriting any and all changes made by the function. If you are calling Asynchronously, there is also a risk that these functions may not execute in the order you expect them to. Zen programs are case-sensitive. If you are not experienced with case-sensitive programming, case might be your biggest adjustment in using Zen. Remember that a is not the same as A. The following naming conventions apply throughout the Zen code. These conventions use case to distinguish between different categories of method or property. myMethodName and MyMethodName are not the same name. InterSystems strongly recommends that you do not create any classes in a package called ZEN.Component using any combination of uppercase and lowercase characters. Creating a package called ZEN.Component breaks the Zen framework for generating client-side code. If you are an experienced Caché user, you are already familiar with the SAMPLES namespace. In particular, the sample application Cinema is a favorite with users learning about Caché Server Pages (CSP). 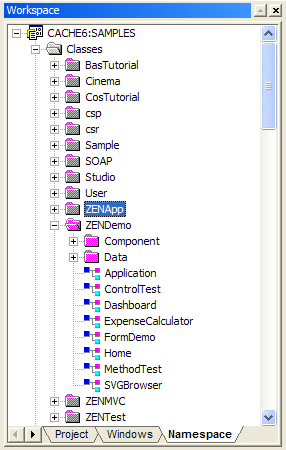 Zen offers a large number of sample pages, organized into packages in the SAMPLES namespace. If you have a new Caché installation, you must first run the ZENDemo home page. Loading this page silently generates data records for the SAMPLES namespace. You only need to do this once per Caché installation. Where 57772 is the web server port number that you have assigned to Caché. In the Workspace window, choose the Namespace tab and open the Classes category. Packages ZENApp, ZENDemo, ZENMVC, and ZENTest are available for you to explore. You can also examine any of the other Caché samples, including the Cinema application near the top of the list. There is also a Studio tutorial that uses Zen wizards to create the user interface for a simple application. See the chapter Building a Simple Application with Studio in the book Using Studio.